A rather impressive amount of research has been done on many episodes and patterns of the Syria conflict at the ACLOS wiki (A Closer Look On Syria), by collecting and analyzing work, reports, and videos by others. So far only select highlights have been brought to this site, with ACLOS links on these crossover subjects given with each post, usually. While not perfect or final, the quantity, quality, and consistency of our results increasingly make these side-lined "pro-regime" analyses much stronger than the pro-opposition versions sold at the time. This is more the shape any reasonable history book will take on the subject. The sharing invites the reader to get ahead of the curve. The sharing works well when it's two-way. Readers with valuable info, or relevant opinions, are encouraged to submit it in the comments. Preferably they'll be in a post about just that subject (note - not every subject has a post here, and comments sometimes get a bit random, let's limit that a bit more.) General Syria comments could best go in comments under this masterlist, for example. Some of our best work has been in tackling the events in Syria that came closest to triggering outright military intervention to "stop Assad" or get cited the most by those arguing for such moves. This is my top 7 from among these (re-ordered May, 2016). Note: this assembled material makes this post a valuable resource to bookmark, peruse, and share. 1 The Peaceful Protests of 2011 that "Assad" crushed ... this is the primary argument for why "the regime must go" - because it didn't already when some citizens demanded it, and started instead shooting and arresting people, always blaming imaginary armed "terrorists," and some "conspiracy." 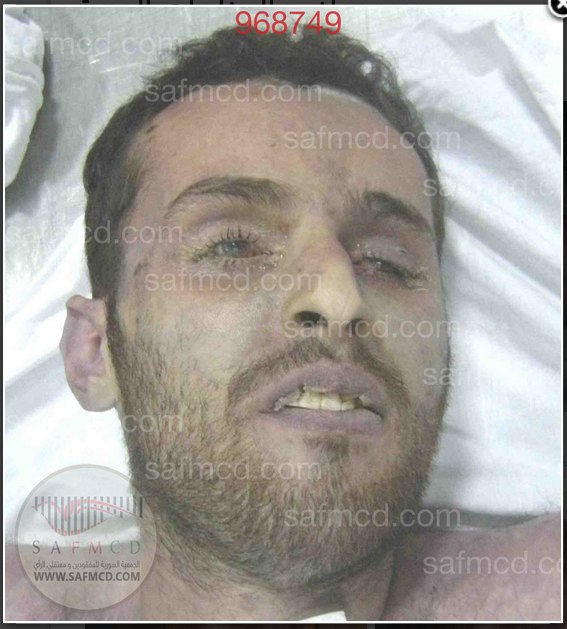 * Daraa Re-Considering Hamza al-Khatib and the Events of April 29, 2011 Arrested from a peaceful protest and tortured to death? Seriously - that's a question mark at the end. * 2.A Idlib Chemical Massacre, 4-4-2017: Alleged sarin attack in Khan Sheikhoun said to kill over 100, including 43 children, triggering the first direct (overtly intentional) US military strikes against Syrian forces ... heavy stuff, ongoing investigation. How did the White House already find out the truth so quickly? They couldn't have. They just took the rebel-claims, which might have concealed a fairly well-planned terrorist false-flag massacre of their own captive civilians. * 2.B Syria Chlorine Allegations (March-? ?, 2016, emphasis on the first incident, March 16 - overview. * 1 Why Chlorine? If hundreds allegedly killed by Sarin didn't get rebels a NATO air force, why would they bother faking barely-deadly chlorine attacks? Here's why. * 2 What Killed the Talebs? 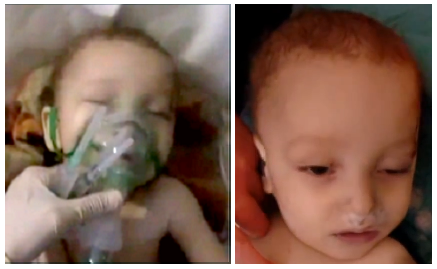 March 16: Rebels and allied medical activists said it was chlorine dropped by the government, but the visuals suggest the children at least were killed instead with a drug overdose, assisted by medical negligence. * 3 Where was Dr. Tennari? The main source for the apparently false chlorine claims of March 16 is the director of the hospital where the children died. By the video record, doesn't even know where he was that night. Or is this intentional dishonesty? Something you have to wonder why noone has noticed it so far ... most chlorine deaths are chalked up to people just sitting there and dying in their homes ... but this makes no sense from a scientific perspective. Ooops. That makes these stories read more like (poorly-researched) fiction than like fact. Alleged: Sarin gas attack by rockets that killed over 1,400, allegedly - Damascus suburbs, August 21, 2013 - led to serious threats of US military attack. Perhaps the best lead was discovered by an ACLOS ally in his own detailed study that established one batch of victims -in Kafr Batna - was almost surely gassed by rebels with carbon monoxide or hydrogen cyanide gas, in a rebel-held basement. And one victim was executed by a cut throat in the morgue upstairs, after he survived, and in between propaganda videos blaming "Assad" for all of it. So a good guess is: "Assad" was responsible for none of it. See The Ghouta Massacre's Sarin Myth, Brightly Lit: Exploring Kafr Batna's... Rebel Gas Chambers? * The false-flag gassing of Alawite hostages seized from Latakia just days before... apparently didn't happen. See bottom of the post about them. the Syria Chemical Weapons Probe was "Torpedoed" by the West - check my May, 2013 prediction at the end of that. This has been prominent recently, and is now well-covered - detailed and explosive report forthcoming. signs torn off by Russian bombs? This hasn't remained a central issue, but it is of some importance in context, and fairly well exposed. 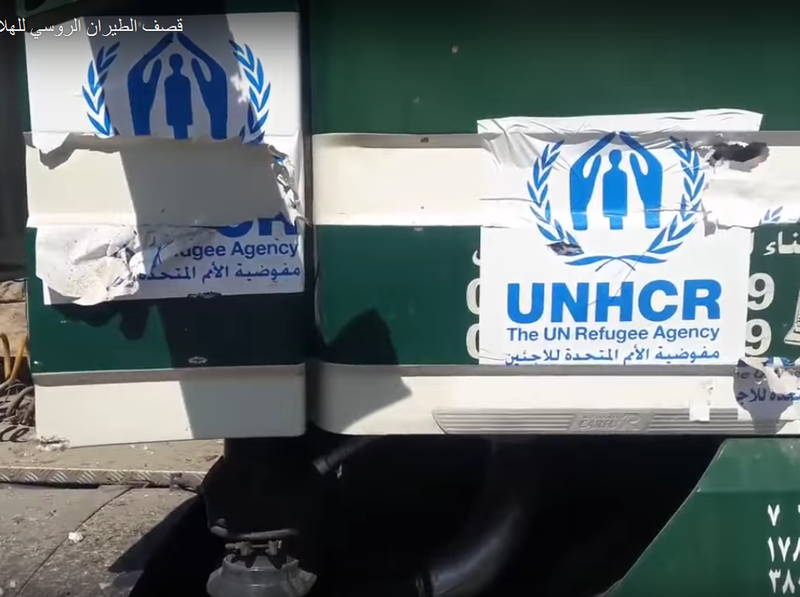 September 19, 2016: a truck convoy carrying medical aid is attacked, with perhaps everyone killed and most aid destroyed, allegedly by Russian or Syrian bombing. But they had powerful disincentives (the attack derailed a Russia-backed plan to widen the fight against Jabhat al-Nusra), and local Islamist rebels in turn had the real motive (to kill that cease-fire and keep their JaN allies protected). The supposed proof of a Russia-Syria attack apparently does not exist, and many signs say it could very well be the terrorists with the motive - and/or perhaps a sympathetic air force - that carried out this false-flag attack. 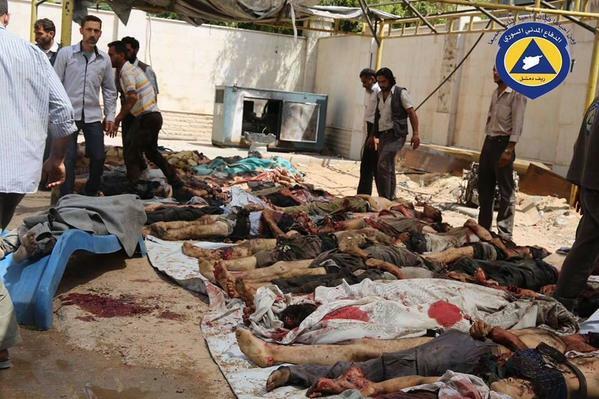 (Taldou, al-Houla, Homs, May 25, 2012) Alleged: 108 Sunnis killed, including 49 children, by army shelling and home invasions by Alawite Shabiha militia. Instead, it seems "rebels" or "terrorists" did it, just after they took over all the town's security posts. This was the last part of Houla the rebels didn't hold yet. Check and see, they finally took Taldou too, and it happened on May 25, 2012. And despite rebels trying not to show that happening, carefully analysis of the few videos of the day they did release, shows rebels taking over on that day. The witnesses who correctly describe the battle for the Houla Massacre say the victors killed Sunnis who converted to Shi'ism, Sunnis who supported the "Alawite regime," and - in a nearby town, killed by other rebels - Alawite civilians. 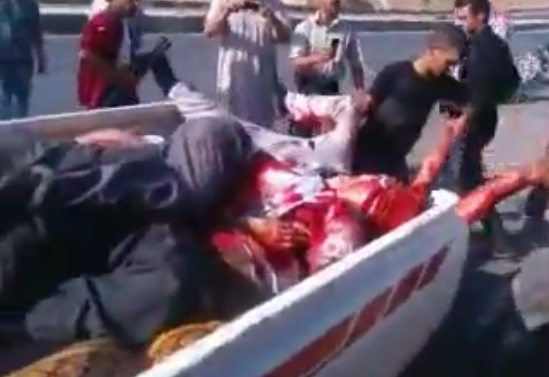 Alleged: Assad's Alawite Shabiha militias massacre Sunnis for no other reason in two Sunni-populated towns of an Alawite-majority province, in an almost universally accepted plan of ethnic-sectarian cleansing. But surprise, the terrorists whose agenda is furthered by mayhem in every province of Syria - it seems - actually caused this mayhem as well. * Syria's al-Bayda-Baniyas Massacres and "Targeting Specific Communities" They killed a controversial, outspoken government loyalist Imam and dozens of his family, comprising at least half of all victims (counts are very complicated with this one, ranging from 70 to 250+) This seems to be the main target. Sunni, but no longer on the wrong side. * Bayan Jalloul, Martyr for Truth? In the next massacre, the alleged Alawite militias did kill an alleged opposition activist and her family. The story tries to counter the one above, but it's bizarre and falls apart. Note: this time the 200 dead seems less debatable, but could well include laundered Alawite victims from the city, and maybe lots of them, depending. August 16, 2015: an alleged government fighter jet missile attack on 3 crowded public farmer's markets - 550 wounded, 112-125 or more killed, Syrian government universally blamed, no proof there was a jet involved, and serious questions about what really happened. 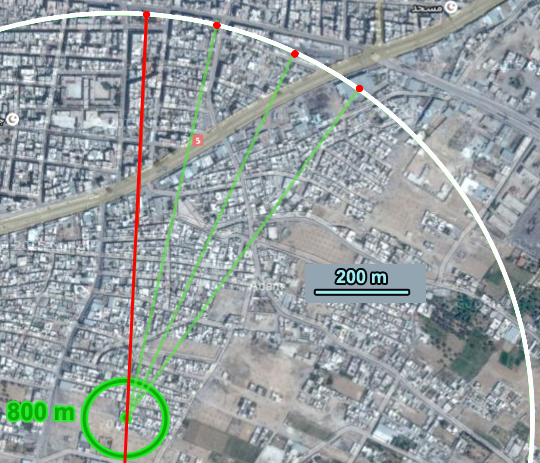 Why does the pattern of alleged jet strikes look more like the arc of a surface rocket attack? Why is the given time of attack so vague, and why were many or most victims dead before the apparent time of attack? Why did the bombs kill almost exclusively men and older boys? Why were they all put in mass graves? Why are the injury/death types different for different genders and ages? 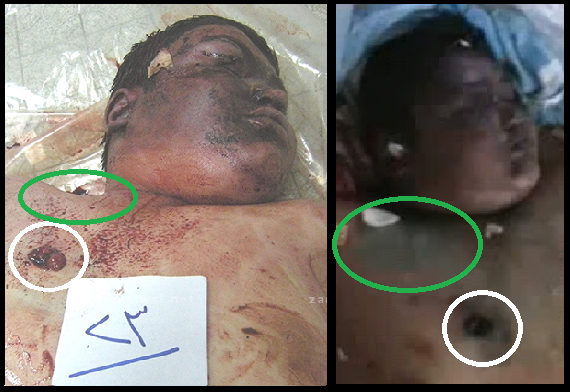 How did a jet missile pull one boy apart like he was drawn and quartered, then burn just his face? Why does the "world community" not seem to care about any of these questions? 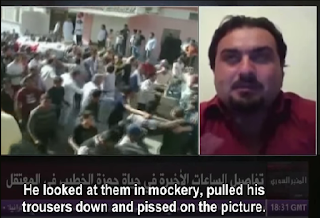 * Douma Cages: Genocidal Display or Twisted Hoax? * Ariha market, Aug. 3, "massacre of the jet"
* Syria Disaster Blame: "Assad" or the Regime Change Campaign? * Responding to Eric Draitser's "Break the Silence"
* White Helmets Covering up Genopcidal Massacres? * The "Assad Files," smuggled documents said to prove orders for mass torture, rigorously assessed, along with the key witness. * Jaish al-Islam's way of protecting the Syrian people - on the Saudi-backed "Army of Islam" that was armed to threaten the capitol\, and their record of genocidal crimes against the people in their domain. 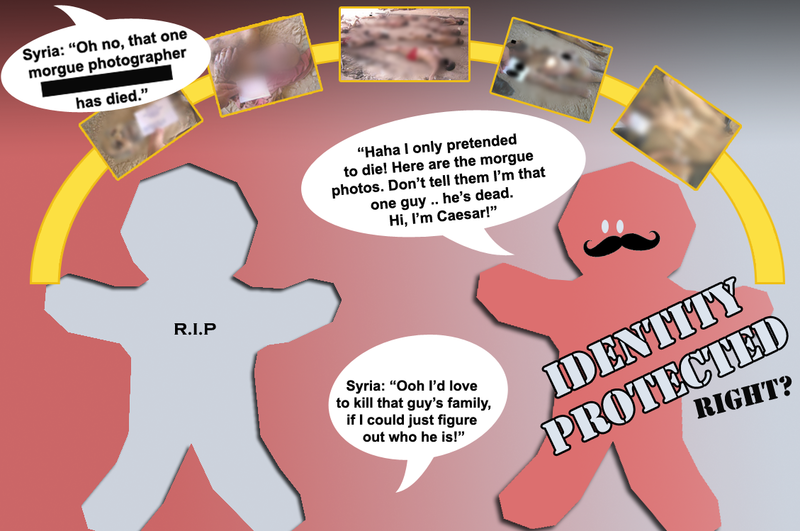 * 2012, at the listing of JaN as a terrorist group - protest solidarity: we are all terrorists - a false visual summary (see right) of a real problem. * Lessons for the Syria Situation: Old post, before any research on Syria, summarizing a few overall findings from Libya that it was thought might be relevant. 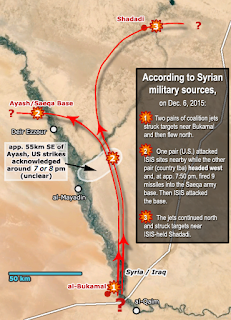 * Second ISIS conquest of Palmyra, late 2016: Did John Kerry Collude with ISIS? * Hayan Missile Massacre: August 12, 2016: 12 children and women killed by an air-strike ... or actually dumped here days after being executed, as the second part of a mass killing of a detained family. Jabhat al-Nusra (al-Qaeda terrorists) administer the area. * Al-Quds Hospital blast: an Inside Job? East Aleppo, April 27, 2016. 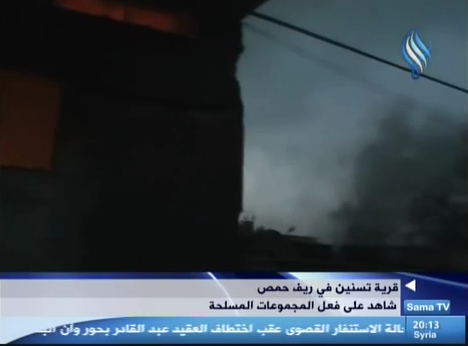 We can already see no air-strikes hit the building, but there explosions inside... and security video footage basically proves it was arranged from the inside. 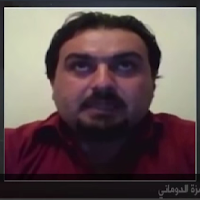 * Ter Malla Massacre: al Qaeda or Russia/Syria Bombing? 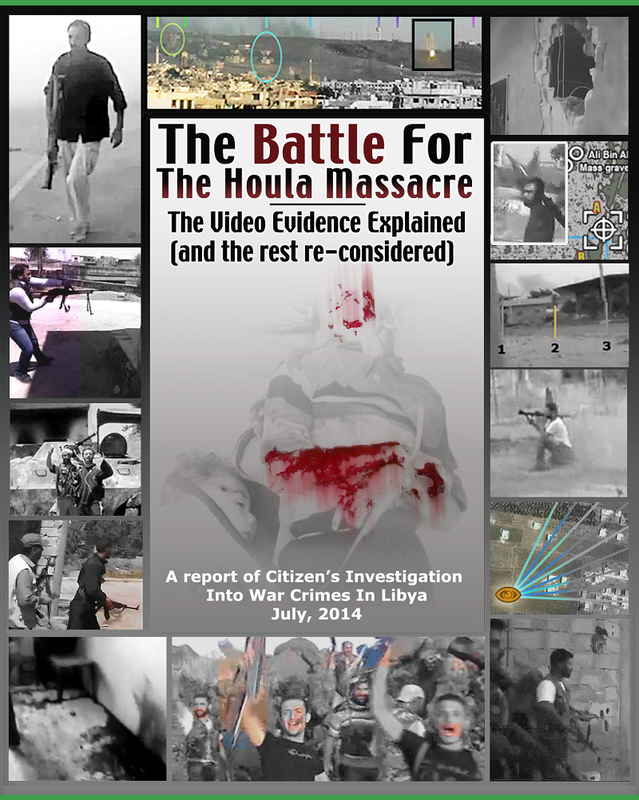 * Ma'an Massacre, 2012: Did the Rebel Offensive Falter? 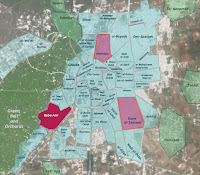 * Daraya Massacre August 24-26, 2012, Damascus suburbs, claims of several hundred innocents killed as the army re-conquered a rebel-held suburb of Damascus. But it seems many were rebel fighters killed in that battle, and many others were civilian hostages held by rebels. Early post summarizing initial ACLOS research. - Homs Massacres (April, 2011 through 2014 - app. 1,558 - 3,089 dead). Posted June 18 - a decent recap and partial summary of the massive ACLOS page and sub-pages, since expanded more. - Reviewing "The Societys Holocaust" June 22, after noticing a new report by the opposition SNHR, publicized on June 19. This one one was about sectarian massacres nationwide, but wound up half of them were in Homs. Check out their coverage of the Aqrab Massacre ... of 6 Sunnis. From there, largely as linked at the review, a bunch of massacres in the Homs orbit I missed before, from the SNHR report - considered in posts here, and then added to the ACLOS project. Date not given, possibly not as early as the others. 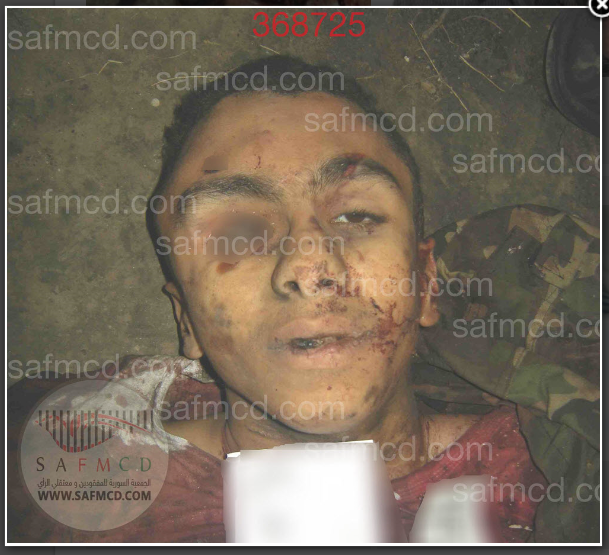 This is a young man who wore military fatigues, fighting with some side. He was apparently shot in the torso, given a nasty knock on the head and taken prisoner by opposing forces, and then his right eye was perhaps popped out. but an uncommon personal one that translates "fighting." Only one VDC "martyr" is in possible frame - Arkan Mustafa al-Khalil from Tibet Al-Ima, Hama. He was killed 2013-01-08 by Shelling - and a civilian, not likely to wear camo. Not a good fit. No one named Arkan appears among FSA, ISIS, or other fighters classed as "martyrs" by the VDC. 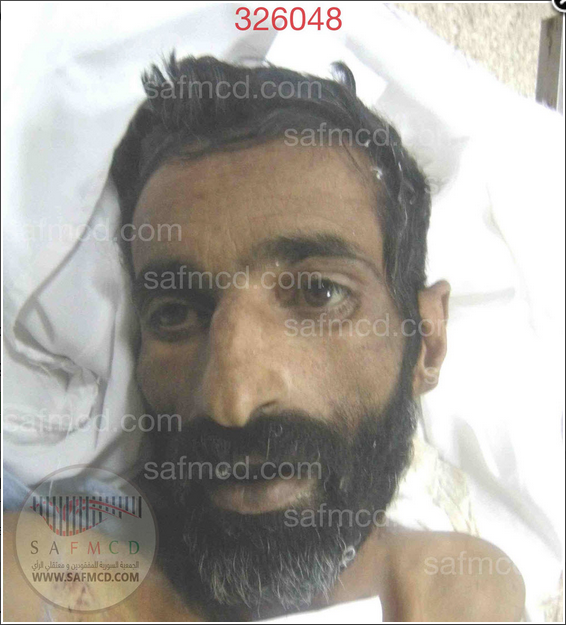 Arkan Mahmoud Khider Zaiton, from Homs. Date of death 2012-04-25 by Shooting. Rank Colonel Notes Source : SANA (no link). Colonel sounds older than seen, but maybe. This "Arkan" might not be listed, at least under that name. Is it just a way of saying this one died while fighting? This is from the Air Force intelligence folder. He's prisoner #4 from folder "2012?"? There's no such folder otherwise. Or no number, from 4-2012? There's also no April 2012 folder, aside from him. (see here). 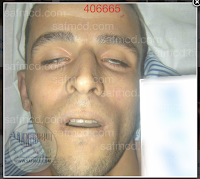 The Arabic translates Mohammed Noureddine Salkini. That name is mostly listed by the VDC as Noor Eddin Salqini. non-civilian. Rank: soldier. Nothing about defection is noted. Occupation Telecommunications Engineer. 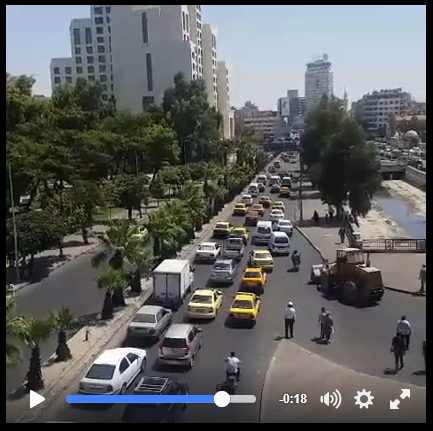 From Homs, Inshaat. Pre-death photo below at right. What they did after they arrested him, whoever it was, left his lips purple, skin and eyes red/irritated, mucous crust in mouth and eyes, yellow staining from more mucous around mouth and nose. All this says he was gassed with something caustic like chlorine (see upcoming report...). الرحبة 563-علاء يحيى ست الدار-5-2012 (1) (shown at right). He's also listed by VDC, but again not with full name, and not even as a martyr. Army status here carried through - "regime fatalities' database includes Alaa Yahia Sit Al-Dar, Rank: Soldier, from Homs. Citing a SANA article, they say he was killed 2012-05-20, by "shooting." The link doesn't work, but http://fedaa.alwehda.gov.sy/node/139640 agrees. Autoi-translated, this lists "Rookie Alaa Yahya six House of Homs" as part of "The funeral of the bodies of 18 martyrs from the army and the maintenance of order and civilians," on May 22, 2012. To wind up among these photos, normally, he'd have to be briefly unidentified, separated from his team and found elsewhere. If that card only has numbers, then he was identified after. If that has his name, he doesn't belong among the "secret detainees" photos. 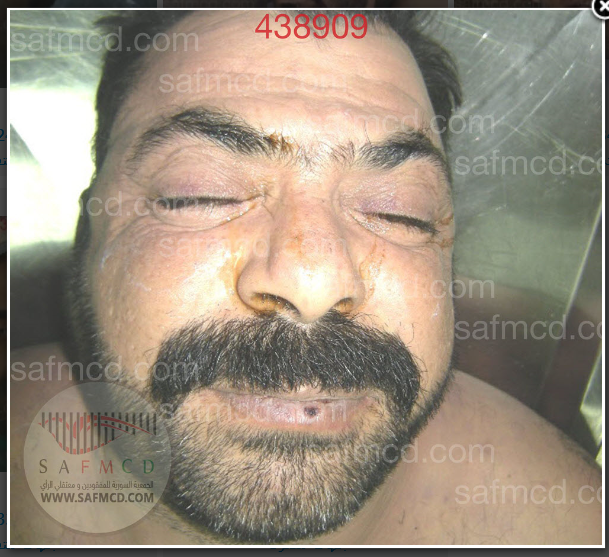 like Salqini, apparent chemical victim - yellow crud from the nose and up the face, possibly mild cyanosis in lips or eye problems, otherwise not clear. The name here translates Ismael Mumina. Searching the proper Arabic spelling, this one has two entries, one for after his non-secret death, another for when he was identified following the release of Caesar's photos (this one with the name built right in). Video of the martyr, posted September 4 (dark video, their still here) - not secretly buries but handed back to family and then seen by these activists - unless filmed by them before the body was dumped to find - certainly anytime in 2011 is a bit early for the eventual system to be in place - stupid moves might have ruled back then. Another video shows he posed for lots of photographs, wasn't big on smiling, but had a really zany mustache (before the war, I presume). Another I can match -up: 11-2011-Ahmed Hawas (1) that's translated - the Arabic is a partial name the VDC lists in full as أحمد حواس الحريش الشمري or Ahmed Hawas Al Hareesh Al Shemri, from Hasakeh, Yaarebiyeh Hareesheh. No picture to compare, but the name is unique, can hardly be a coincidence. Consistently, it says he died from "Detention - Torture." Actual cause of death, unclear. Apparently related to the detention part: "Wounded by shot." Date of death is a bit later - 2011-12-15 - same guy listed late here or early there seems most likely.